The Brazen Altar burned brightly with flaming symbolism – it was the place where sin was judged. Today we look to the laver, and it too is brass, but that’s about the only similarity. • The altar has fire in it, the laver has water. • The altar speaks of reconciliation, the laver of sanctification. • The altar deals with the penalty of sin, the laver with the practice of sin. • The altar is about a convicted sinner, the laver is about a consecrated believer. After the priests accepted the sacrifices for the people they needed to be cleansed before they could perform any further work on the behalf of men and themselves. They had become polluted by dealing with the sin-stained masses and by working to bring them to the forgiveness represented at the Brazen Altar and paid for by Christ. On to the Laver, ….The Brazen Laver! The Brazen Laver, or basin, was a large brass bowl filled with water. The brass was taken from the mirrors of the women (Ex.38:8). lavatory which carries the meaning of place of washing. from their hands and feet before entering into the Tabernacle. The Brazen Laver speaks of Sanctification even As the Brazen Altar spoke of Justification. The word SANCITFY means to be SET APART. The laver was placed between the door of the Holy Place and the altar. The appointed priest, as he entered the gate of the outer court, faced the altar, where he made a sacrifice for himself like any other Israelite. Once beyond the altar he was ready to act as a serving priest and so at the laver he prepared himself for the further service of God. He could then minister at the altar or in the Holy Place because he washed at the laver. A. The Brazen Laver stood about halfway between the Brazen Altar and the Holy Place (Ex.40:30). The altar always came first for the priest. God was approached by way of the blood and the water. B. Unlike the bronze altar that was available to everyone, only the priests had access to the Laver. Those who have put their faith in Jesus are called a royal priesthood, chosen generation a holy nation. Within the door of the Holy Place were vessels that represented God Himself. No priest dare enter with any trace of uncleanness. "Be holy as I am holy" was commanded to the priests. In the outer court everything was bronze. Inside the Holy Place everything was gold. As the priest came out of God’s Presence and back into service he washed at the laver. 3. Every time a priest drew near to commune with God, he was required to wash in the Laver first. Any defilement on him would cause his death. Today this Laver is the Word of God (Eph.5:26). 1. If we have accepted Jesus as Lord, we are priests under the New Covenant and should be continually washing daily in the Word. 2. Keeping ourselves spiritually clean is the responsibility of every Christian by the daily exercise of applying God’s Word in everyday living, to keep our thoughts and motives pure. 3. We need to allow ourselves to stand in the place where the Word of God can cleanse and sanctify us daily. · The feet represented where they went, their lives and ways. Their walk had to be a holy walk, so their feet were washed always, every day. · The hands speak of what they did, their service, their work, everything they put their hands to was important and so their hands needed to be cleansed always, and daily. The Laver deals with present sins (iniquity, selfishness, self)… as it continually cleanses our acts of the flesh that would keep us from being filled with "all the fullness of God". Cleansing us from the filthiness of flesh and spirit. Its size speaks of the limitless cleansing power of God. · No measurements or instructions are given as to the shape and size of the laver. The only thing mentioned is that it had a stand (Ex 31:9), which made it easier to wash, and it was made of solid bronze, no wood at all. · No man can say how much of the Word will be required to cleanse any one person, or sacrifice. Just as each man differed in size so the volume of water needed to cleanse him varied. The same is true spiritually. Ex 38:8 He made the laver of bronze and its base of bronze, from the bronze mirrors of the serving women who assembled at the door of the tabernacle of meeting. But it had to be big enough to function as a place of cleansing, large enough to hold an incalculable amount of water. o How was it conveyed and poured into the laver? What happened to the ‘gray water’? How the laver was carried we are not told. The altar and other vessels had staves and rings by which they were carried but nothing is mentioned about the laver. Maybe there was a lip around the top edge as in the illustration. 1. The Brazen Laver was a place provided for cleansing. The Brazen Laver was provided by God for the sanctification of the priests. The word sanctified means to be set apart. · First the Christian is set apart from sin. · Third the Christian is set apart for divine service. 2. The Brazen Laver was a place provided for self-judgment. When the priest became defiled, he was required to wash himself. It is our responsibility to take care of any sin that may come between us and God. 3. The Brazen Laver was a place provided for reflection. The priests would see their reflection as they looked into the Laver while washing themselves. As we look into the Word/Laver, we do not see our own reflection, but we see Jesus. With continual gazing at Him, we are transformed from glory to glory into His image. 1. After the priest was justified at the Brazen Altar and sanctified at the Brazen Laver, he was now ready to offer worship and service to the Lord. The greatest privilege of every Christian is to have direct access into the presence of God. As we walk in this contaminated world, we are defiled by the sin around us and must continue to "clean" off that defilement with the Word. Welcome to a series of expositions by Dr. Ed Bez on the books of the Bible which contain only one chapter. There are four books in the New Testament (Philemon, II and III John and Jude) and only one Old Testament book, Obadiah. 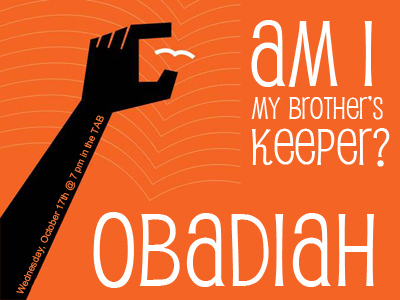 The name Obadiah means "Servant of Yahweh" (literally -- "One who serves or worships Jehovah"). This prophecy has the distinction of being the shortest book in the OT. There are twelve different individuals in the OT with this name (a very common name), but no indication that any of these other individuals are to be identified with this particular prophet. Nothing is known about his life, background or personality except what little can be inferred from this prophecy. It is assumed that he was a native of Judah. Others feel he may also have been among the circle of prophets attached to the Jerusalem Temple. The Jewish Talmud states Obadiah was not Jewish, but rather an Edomite proselyte God used to rebuke his own people. 585 BC --- This is the view held by most liberal scholars. It places this prophecy about a year after the fall of Jerusalem to the Babylonians. There is a similarity between numerous phrases found in Joel 3 and Obadiah. It appears that Jeremiah was familiar with the work of Obadiah. Compare Jer. 49:7-22 with Obadiah 1-9. There is "strong evidence that the prophet Jeremiah had read and adapted for his own purposes Obad. 1-9" (Archer). This prophecy is against the people of Edom. The Edomites were descendants of Esau (Genesis 36:8-9), whereas the Israelites were descendants of Jacob, the twin brother of Esau. Thus, the peoples were very closely related. From the very beginning there was enmity between these two brethren --- an enmity which carried over to the nations which descended from them. •	Jacob and Esau "struggled together" within the womb of Rebekah (Gen. 25:22). In the next verse the Lord tells her, "Two nations are in your womb." •	There was conflict over the taking of the birthright by Jacob from Esau (Gen. 25:27-34). It was at this time that Esau gained the name Edom (meaning "red") --- the color of the stew for which he sold his birthright (Gen. 25:30). Much of the land occupied by the Edomites was made up of dark red sandstone; this was also the color of Esau at his birth (Gen. 25:25). •	There was conflict when Jacob tricked Isaac into blessing him instead of Esau (Gen. 27). •	There was trouble years later as the two brothers met (Gen. 32-33). Conflict between the two nations (Edom and Israel) began at the time of the Exodus from Egypt when Edom refused to let the people of Israel pass through their region on the way to the promised land (Numbers 20:14-21). Edom refused food and water and passage as a grudge. •	This enmity continued until the time of King David when he put them under subjection to Israel (II Samuel 8:14). During the reign of Jehoram, Edom revolted (II Kings 8:20-22; II Chron. 21:8-10) and set up their own king. It was during this time, about 845 BC, that Obadiah gave his prophecy to the people of Edom. The people of Edom were continually filled with hatred for Israel. Speaking of these people, Amos 1:11 says, "he pursued his brother with the sword, while he stifled his compassion; his anger also tore continually, and he maintained his fury forever." As a result, Malachi 1:3-4 says that the Lord would utterly destroy the Edomites. They had become the people "toward whom the Lord is indignant forever!" During their later history the Nabatean Arabs took over the territory of Edom and drove them from their land. They fled to the area south of the Dead Sea, and in time came to be known as the Idumaeans. Around 120 BC they were conquered by John Hyrcanus of the Maccabees, who forced many of them to be circumcised and to accept the Law of Moses. During the trial of Jesus Christ we see the final confrontation --- Jesus (a descendant of Jacob) stood before King Herod (a descendant of Esau). "By 100 AD the people of Edom had become lost to history" (Homer Hailey). "If you travel today in the region of Edom, you will find nothing but the most stark wilderness and the most isolated emptiness ..... it is one of the most formidable, forsaken spots on earth" (Briscoe). They will "become as if they had never existed!" (Obad. 16). The city of Jerusalem had been attacked by the Philistines and Arabians. The city had been stormed and looted. Edom, who was in a state of revolt, sided with the invading forces and shared in the spoils (Obad. 11). They gloated over Israel's misfortune (Obad. 12-13), and killed or imprisoned those who fled the destruction (Obad. 14). The use of Jacob and Esau in particular, along with such phrases as "your brother," draws attention to the blood relationship between these two nations. "It is the violation of these ties that occasion both Obadiah's denunciation of Edom and the necessity for Judah's restoration" (Expositor's Bible Commentary). •	John Calvin once remarked that because of the brevity of Obadiah it did "not suggest as many sermons" as the longer prophetic works. Although this may be true, there are nevertheless numerous lessons to be derived from this book. For example --- when one shares in "the spoils of wrong-doing," even though he may not be an instigator of the crime, by "standing aloof" he becomes "as one of them" (Obad. 11). •	When someone (even a nation) becomes unjust, cruel and bitter toward someone else ..... especially when they're brethren ..... they will be punished, and the one wronged will be avenged. •	As a people sow, so will a people reap! "Do not be deceived, God is not mocked; for whatever a man sows, this he will also reap!" (Gal. 6:7). The Edomites sought to destroy the Israelites, and were themselves destroyed (see Obad. 15). •	Obadiah makes it clear that the idea of a nation being invulnerable is an illusion! Edom felt so secure that they believed no one could destroy them. They built entire cities which were hidden within cliffs, and which could only be reached by narrow passes --- the famous city of Petra, which was carved from a mountainside, was in Edom. Their security, however, was misplaced. God said He would destroy them, and history demonstrates how this occurred. •	The people were proud and arrogant which led them to be self-deceived. "The arrogance of your heart has deceived you, you who live in the clefts of the rock, in the loftiness of your dwelling place, who say in your heart, 'Who will bring me down to earth?'" (Obad. 3). The answer is in the next verse --- "'From there I will bring you down,' declares the Lord." •	The Edomites had become wise in their own eyes. They had all the answers; had need of nothing; God had been left out of the picture. In the OT there is no mention of any Edomite religion or any Edomite gods. "The Edomites had no allegiance to a god. This has led many scholars to believe that this unusual people were so self-sufficient, arrogant, and self-satisfied that they wouldn't even call upon the name of any kind of god. They believed they had all the answers themselves!" (D. Stuart Briscoe). •	The Kingdom of the Lord will always ultimately prevail (Obad. 21 --- "And the kingdom will be the Lord's"). •	The ultimate sin of Edom was "a manifest display of lack of brotherliness" (Jack P. Lewis). Edom stood by and gloated over the misfortune of a brother nation. "He who rejoices at calamity will not go unpunished" (Prov. 17:5). •	God provides a place of escape for those who would turn to Him --- Mount Zion (Obad. 17).